Ttext in blue will open in new tabs. This post is link heavy! Crochet is a fibre-craft that I taught myself a few years ago, when I dropped out of uni with a case of the mentals (read: depression, mental breakdown, leave of absence). I use crochet a lot to manage my mental health. It is great when I am anxious because it keeps my brain focused and my hands busy. The reason I have so many handmade blankets is because they are easy to make and take very little brain power, and is a great relaxation technique for a crazy brain. In 2014, the Geological Society of London released a pattern to make a mini Mary Anning – and of course I just had to make her. Mary Anning is one of my ultimate Science Women™, and so I set to work. There is also a Darwin pattern available (I haven’t made him – yet). I have also made a trilobite, and he has been called Malcolm. This trilo is my third or fourth attempt at the pattern, and I somehow managed to give him really evil eyes! This pattern came from Ravelry. There is another pattern available too but I haven't had much luck with it, I have not mastered front post double crochet yet! Next up, is Nessie! I made this when I was signed off sick (with the mentals) last year. Nessie now lives in my window, with a paper cocktail umbrella behind an ear. Last up, the ammonite. I made this by reverse engineering – I couldn’t find a pattern I liked, but I found a pic I liked, so I used that. I started at the aperture end and got smaller, I think I did some maths to calculate how big I had to start it, then decreased my way along the tube. It is stitched in a coil, and then I made a circle to cover the end. 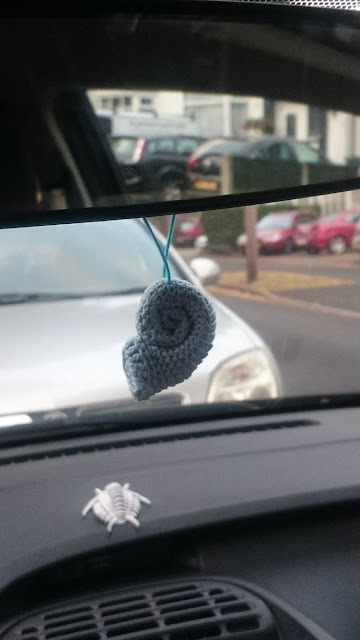 I also have a smaller blue one made with embroidery thread hanging from the mirror in my car. There is also a pattern on Ravelry. Yes that is also a 3D printed trilobite on my dash.